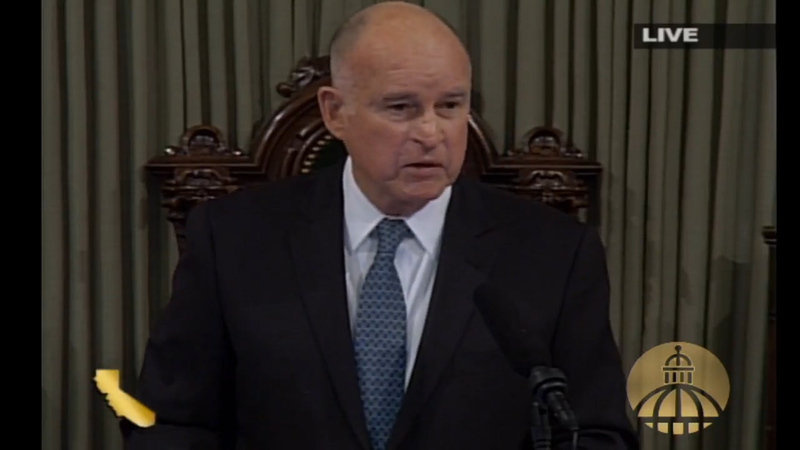 Governor Edmund G. Brown Jr. delivered his 16th – and final – State of the State address today asserting that the “bolder path is still our way forward” on climate change, infrastructure investment, health care, education and criminal justice. Governor Brown also recognized the efforts of firefighters, first responders and volunteers who “answered the call to help their fellow neighbors” this year and the “profound and growing challenge” of extreme weather and fires in California. Citing “endless new weapons systems, growing antagonism among nations, the poison in our politics, climate change” and the Bulletin of the Atomic Scientists “Doomsday Clock” moving 30 seconds closer to catastrophe, the Governor warned that “our world, our way of life, our system of governance” are all at “immediate and genuine risk” and called “for courage, for imagination and for generous dialogue” from Californians. Good morning. As our Constitution requires, I’m here to report on the condition of our state. Simply put, California is prospering. While it faces its share of difficulties, we should never forget the bounty and endless opportunities bestowed on this special place — or the distance we have all traveled together these last few years. It is now hard to visualize — or even remember — the hardships, the bankruptcies and the home foreclosures so many experienced during the Great Recession. Unemployment was above 12 percent and 1.3 million Californians lost their jobs. Even today, you will find critics who claim that the California dream is dead. But I am used to that. Back in my first term, a prestigious report told us that California had the worst business climate in America. In point of fact, personal income in 1975, my first year as governor, was $154 billion. Today it has grown to $2.4 trillion. In just the last eight years alone, California’s personal income has grown $845 billion and 2.8 million new jobs have been created. Very few places in the world can match that record. That is one of the reasons why confidence in the work that you are doing has risen so high. It contrasts sharply with the abysmal approval ratings given to the United States Congress. Certainly our on-time budgets are well received, thanks in large part to the lowering of the two-thirds vote to a simple majority to pass the budget. All are big and very important to our future. And their passage demonstrates that some American governments can actually get things done — even in the face of deepening partisan division. The recent fires and mudslides show us how much we are affected by natural disasters and how we can rise to the occasion — at the local level, at the state level and with major help from the federal government. I want to especially thank all of the firefighters, first responders and volunteers. They answered the call to help their fellow neighbors. Here we see an example of people working together irrespective of party. The president himself has given California substantial assistance and the congressional leadership is now sponsoring legislation to help California, as well as the other states that have suffered major disasters — Texas, Florida and the Commonwealth of Puerto Rico. In this regard, we should never forget our dependency on the natural environment and the fundamental challenges it presents to the way we live. We can’t fight nature. We have to learn how to get along with her. And that is not so easy. For thousands of years this land now called California supported no more than 300,000 people. Today, 40 million people live here and their sheer impact on the soils, the forests and the entire ecosystem has no long-term precedent. That’s why we have to innovate constantly and create all manner of shelter, machines and creative technologies. That will continue, but only with ever greater public and private investment. The devastating forest fires and the mudslides are a profound and growing challenge. Eight of the state’s most destructive fires have occurred in the last five years. Last year’s Thomas fire in Ventura and Santa Barbara counties was the largest in recorded history. The mudslides that followed were among the most lethal the state has ever encountered. In 2017, we had the highest average summer temperatures in recorded history. Over the last 40 years, California’s fire season has increased 78 days — and in some places it is nearly year-round. So we have to be ready with the necessary firefighting capability and communication systems to warn residents of impending danger. We also have to manage our forests — and soils — more intelligently. Toward that end, I will convene a task force composed of scientists and knowledgeable forest practitioners to review thoroughly the way our forests are managed and suggest ways to reduce the threat of devastating fires. They will also consider how California can increase resiliency and carbon storage capacity. Trees in California should absorb CO2, not generate huge amounts of black carbon and greenhouse gas as they do today when forest fires rage across the land. Despite what is widely believed by some of the most powerful people in Washington, the science of climate change is not in doubt. The national academies of science of every major country in the world — including Russia and China — have all endorsed the mainstream view that human caused greenhouse gases are trapping heat in the oceans and in the atmosphere and that action must be taken to avert catastrophic changes in our weather systems. All nations agree except one and that is solely because of one man: our current president. The nation’s only functioning cap-and-trade system. I will shortly provide an expenditure plan for the revenues that the cap-and-trade auctions have generated. Your renewing this program on a bipartisan basis was a major achievement and will ensure that we will have substantial sums to invest in communities all across the state — both urban and agricultural. The goal is to make our neighborhoods and farms healthier, our vehicles cleaner — zero emission the sooner the better — and all our technologies increasingly lowering their carbon output. To meet our ambitious goals, we will need five million zero-emission vehicles on the road by 2030. Think of all the jobs that will create and how much cleaner our air will be. When you passed cap-and-trade legislation, you also passed a far-reaching air pollution measure that for the first time focuses on pollutants that disproportionately affect specific neighborhoods. Instead of just measuring pollutants over vast swaths of land, regulators will zero in on those communities which are particularly disadvantaged by trains, trucks or factories. Along with clean air, clean water is a fundamental good that must be protected and made available on a sustainable basis. When droughts occur, conservation measures become imperative. In recent years, you have passed historic legislation to manage California’s groundwater, which local governments are now implementing. In addition, you passed — and more than two-thirds of voters approved — a water bond that invests in safe drinking water, conservation and storage. As a result, we will soon begin expending funds on some of the storage we’ve needed for decades. As the climate changes and more water arrives as rain instead of snow, it is crucial that we are able to capture the overflow in a timely and responsible way. That, together with recycling and rainwater recapture will put us in the best position to use water wisely and in the most efficient way possible. We are also restoring the Sacramento and San Joaquin watersheds to protect water supplies and improve California’s iconic salmon runs. Finally, we have the California Waterfix, a long studied and carefully designed project to modernize our broken water system. I am convinced that it will conserve water, protect the fish and the habitat in the Delta and ensure the delivery of badly needed water to the millions of people who depend on California’s aqueducts. Local water districts — in both the North and South — are providing the leadership and the financing because they know it is vital for their communities, and for the whole state. That is true, and that is the reason why I have persisted. Our economy, the sixth largest in the world, depends on mobility, which only a modern and efficient transportation system provides. The vote on the gas tax was not easy but it was essential, given the vast network of roads and bridges on which California depends and the estimated $67 billion in deferred maintenance on our infrastructure. Tens of millions of cars and trucks travel over 330 billion miles a year. The funds that SB 1 makes available are absolutely necessary if we are going to maintain our roads and transit systems in good repair. Twenty-five other states have raised gas taxes. Even the U.S. Chamber of Commerce has called for a federal gas tax because the highway trust fund is nearly broke. Government does what individuals can’t do, like build roads and bridges and support local bus and light rail systems. This is our common endeavor by which we pool our resources through the public sector and improve all of our lives. Fighting a gas tax may appear to be good politics, but it isn’t. I will do everything in my power to defeat any repeal effort that may make it to the ballot. Since I have talked about tunnels and transportation, I will bring up one more item of infrastructure: high-speed rail. I make no bones about it. I like trains and I like high-speed trains even better. So did the voters in 2008 when they approved the bond. Look, 11 other countries have high-speed trains. They are now taken for granted all over Europe, in Japan and in China. President Reagan himself said in Japan on November 11, 1983: “The State of California is planning to build a rapid speed train that is adapted from your highly successful bullet train.” Yes, we were, and now we are actually building it. Like any big project, there are obstacles. There were for the Bay Area Rapid Transit System, for the Golden Gate Bridge and for the Panama Canal. But build it they did and build it we will — America’s first high-speed rail system. One link between San Jose and San Francisco — an electrified Caltrain — is financed and ready to go. Another billion, with matching funds, will be invested in Los Angeles to improve Union Station as a major transportation hub and fix the Anaheim corridor. The next step is completing the Valley segment and getting an operating system connected to San Jose. Yes, it costs lots of money but it is still cheaper and more convenient than expanding airports and building new freeways to meet the growing demand. It will be fast, quiet and powered by renewable electricity and last for a hundred years. Already, more than 1,500 construction workers are on the job at 17 sites and hundreds of California businesses are providing services, generating thousands of job years of employment. As the global economy puts more Americans out of work and lowers wages, infrastructure projects like this will be a key source of well-paid California jobs. Difficulties challenge us but they can’t discourage or stop us. Whether it’s roads or trains or dams or renewable energy installations or zero-emission cars, California is setting the pace for America. Yes, there are critics, there are lawsuits and there are countless obstacles. But California was built on dreams and perseverance and the bolder path is still our way forward. In addition to infrastructure and physical investments, California spends huge sums for services which affect people directly such as education, health care and our criminal justice system. In education, after seeing 30,000 teachers laid off, spending has dramatically recovered, increasing by $4,600 per student — $31 billion overall. We will also be able to completely fund the Local Control Funding Formula, which directs more money to those schools with the greatest challenges. For decades, school districts had widely disparate funding until the Serrano v. Priest decision mandated equal funding for all children. Now with our current formula, the most disadvantaged districts will get substantially more — not just equal funding. Importantly, this year’s budget proposes to link spending with the local accountability plans so that parents can see how the additional spending supports English learners and students from low-income families. It is no secret that kids from more privileged backgrounds generally do better on standardized tests. But the answer is not more micro-management with intrusive state laws. Learning takes place in the classroom and that’s why our first job is to support teachers and give them the training and the freedom to teach as they know best. With respect to higher education, it is clear just how much of our prosperity depends on the intellectual contributions of our institutions of higher learning. National leaders come from all over the world to visit California’s most innovative companies, companies that are filled with highly educated and creative men and women — many of whom graduated from our public colleges and universities. $623 million in additional financial aid. Even with so many of our students attending college, there are still 2.5 million Californians between 25 and 34 who are in the workforce but lack a postsecondary degree or certificate. These men and women often go out of state or pay high tuition at for-profit institutions to improve their skills and employability. For this group, I want to create the California Online College so these overlooked Californians can get the training they need — conveniently and at very low cost. When it comes to health care, California has boldly embraced the Affordable Care Act by enrolling five million more people into our Medi-Cal program and 1.3 million into the California health exchange, Covered California. These are far-reaching moves but are largely dependent on tens of billions of federal dollars that would have been taken away by the Congress had the effort to “repeal and replace” succeeded. Thank God for John McCain, Lisa Murkowski and Susan Collins. Along with the Democrats, they prevailed and protected health care for tens of millions of Americans. Finally, I want to say something about public safety. Nothing is more fundamental than an abiding sense on the part of people that they can enjoy their lives, safe and secure, free from crime. Good neighborhoods, good schools and good jobs all contribute to healthy and safe communities. But still there is crime. Lots of it and, in many cases, quite serious. To combat crime, among other things, California has created an extensive prison system that has changed quite substantially and grown over the decades. In fact, it grew so fast and became so crowded that the United States Supreme Court issued an unprecedented order requiring drastic changes. In 1970, California imprisoned 125 persons per 100,000. That number now stands at 331. The corrections budget then was about 3 percent of the General Fund. Now it’s 8.9 percent — about $12 billion. Yet, last year, the number of reported felonies was actually lower than it was in 1970. In 1965, the California Penal Code had about 234,000 words. Today that number has grown to 1.2 million. By comparison, the Ten Commandments run just under 300 words — and the Ten Commandments, there are still ten. In California, there are more than 5,000 separate criminal provisions specifying what is criminal, what the penalties should be, what enhancements should be added and what credits might be earned. Much of this has changed and churned over the decades as the legislature has enacted endless new crime laws and the voters have approved one ballot measure after another, usually but not always, adding ever more time in prison. My plea is relatively straightforward: take time to understand how our system of crime and punishment has evolved, how other states and countries have devised their prison systems and what changes might we now make. I urge that instead of enacting new laws because of horrible crimes and lurid headlines, you consider the overall system and what it might need and what truly protects public safety. Certainly, we need more mental health and drug treatment programs and better training and education. Those we are getting, but more is needed, particularly hope. When a human being gets a 20-or 40-year sentence, as tens of thousands do, incentives to reform weaken and hopelessness and violence take over, making prison gang influence all the more powerful. That is why recent measures are so vital which allow the possibility of earlier parole and milestone credits for those who turn their lives around. Equally important are the correctional officers who walk the halls and put their lives on the line in direct contact with all manner of inmate. Their job is to keep the place safe, never an easy task, and to create an atmosphere of respect and order — and foster a spirit of rehabilitation whenever possible. There are thousands of others who work in the prisons who also deserve our support. It is all out of sight, but profoundly important because most inmates will be returning to their communities and we want them to be as reformed and rehabilitated as possible. For the rest, there is much we can do together before this year ends. These are truly exciting times, full of possibilities but also full of danger. Just this morning, the preeminent science and security board of the Bulletin of the Atomic Scientists moved the minute hand of the Doomsday Clock 30 seconds closer to catastrophe. It is now 2 minutes to midnight, as close as it was at the height of the Cold War in 1953. Our world, our way of life, our system of governance — all are at immediate and genuine risk. Endless new weapons systems, growing antagonism among nations, the poison in our politics, climate change. All of this calls out for courage, for imagination and for generous dialogue. In recent days, hundreds of thousands took to the streets in cities across America to participate in the Women’s March. At the same time, activists championed the cause in our nation’s capital of those young people we call the Dreamers. In all this, California was in the forefront, showing the way. But there is much more to do. All of us — whatever our party or philosophy– have a role to play in defending and advancing our democracy. Our forebears set the example. As you may know my own great grandfather, August Schuckman, in 1849 sailed to America on a ship named Perseverance. He persisted against all the odds and made it to Sacramento three years later. And, yes, we too will persist against storms and turmoil, obstacles great and small. The spirit of democracy never dies. It’s alive in this chamber, in the hearts of Californians and in people throughout the land. Let this be a great year — for California, for our nation, and for our future. Why would you think this kind of language is appropriate on a school district website? To be fair I highly doubt elementary school kids are reading this. Him and his Stoopid Voters (plenty of ILLEGAL as well). California going down the drain. One big TENT CITY STATE. How can he explain away what’s going on in California? Were REALLY upset! Stop this taxation! It’s killing us! We impose the highest taxes AND we are just about the most bankrupt. And the Dems have the nerve to lecture us on the economy. Duh, duh……. I like pudding…..